WHAT IS POWER MUSCLE METHOD? Do you want to increase your strength, stamina and muscle mass? Then Power Muscle is for you! It focuses on complex and isolating lifting techniques and emphasises the importance of following the correct form, so you increase your muscle and strength more efficiently. You'll be working in small teams, (max. 6 members) all dedicated to building and strengthening their bodies. 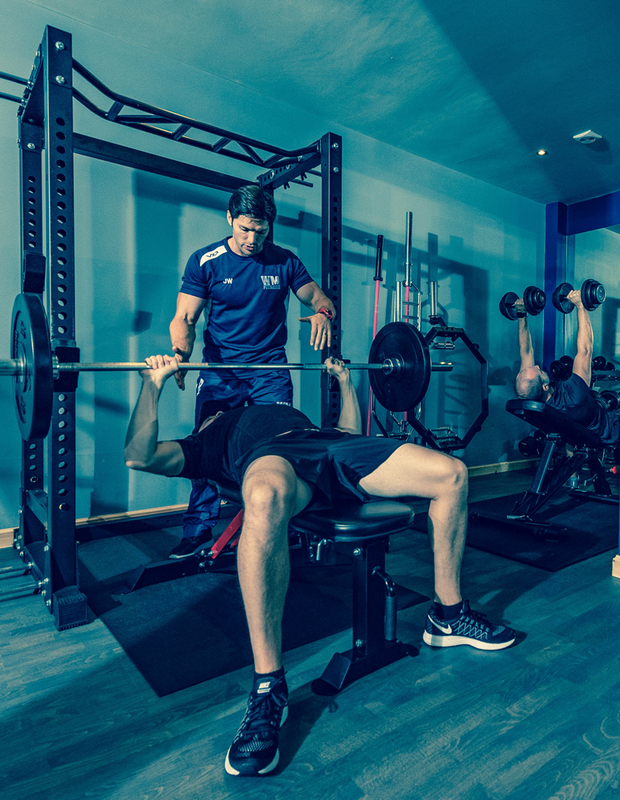 What makes our team sessions different is you'll be following your own individualised programme throughout. Your programme will be specific to you and your requirements. The added training bonus: During your sessions you have the option to track your calories, heart rate and level of exertion through our MyZone system. This will help you track your progress and results. We kickstart each session with a whole body warm up, followed by specific exercises designed to prepare it for the specific demands of the session. The warm-up is a crucial part of the workout, to prevent any unnecessary injuries. For the Power Muscle Method the sessions focus on weighted and intense lifting. The exercises are designed to pinpoint a desired muscle group in each session. The session will finish with an all-over body flexibility cool down. As part of the Power Muscle Method you will also have the option to join our 30 min High-Intensity Interval Training sessions. These HIIT sessions were put in place to perfectly complement the conditioning sessions and have one sole purpose: maximum fat burn! The program has built-in testing weeks to measure lifting and endurance improvements. Body metric tests (skin-fold and circumference measurements) will also be taken, keeping a close eye on how quickly your body is changing. When you join White Method Fitness you will be surrounded with like-minded people, who like you are taking action and making a commitment to their health. For many people gyms can be intimidating places, full of strangers. White Method Fitness is a small private 'members only' fitness studio equipped with some of the best equipment around. Think the Power Muscle Method could be right for you? If so, I would love to invite you to come and meet with me, check out the studio and see if I can help. To get started sign up for your Six Week Transformation Trial by clicking the button below.